Alyson Beaton, a designer mom, was looking for a dollhouse for her daughter's 7th birthday. After she had a hard time choosing between wooden and plastic houses for little children and the usually pricey "grown up" style houses that seemed to be more for show, she decided to design an eco dollhouse herself. Now that vision has expanded and Alyson needs help with her < a> to get her business off the ground. What's in it for you? You'll get awesome Lille Huset dollhouse goodies for your donation! 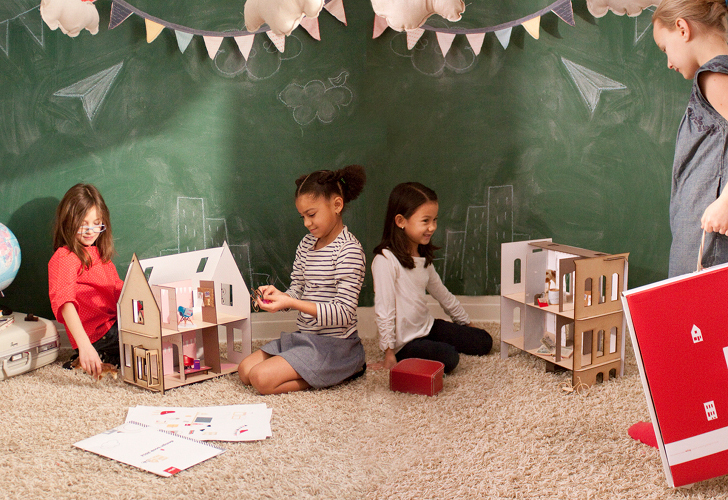 Lille Huset dollhouses are made out of recycled paperboard, birch plywood and recycled paper printed with veggie inks. The packaging is recycled or recyclable and all Lille Huset dollhouses are made in the USA. The recycled paperboard pieces come with paper laminated to the walls which can be redesigned by your child. Alyson has created six different designs for her Lille Huset dollhouse town. The line is inspired by a little house in Chicago’s Logan Square, which is a little neighborhood in a big city. The Lille Huset kit includes: Your house, instructions, a carrying case and a DIY design book so your little designer can take notes, create some of the designs in the book and spend hours playing. There are many options with this Kickstarter program and several ways you can get a Lille Huset dollhouse as part of the deal. With every $15 pledge you get a little house and wooden bike. With every $20 pledge you get two little houses. Pledge $30 and you can get four little houses, carrying case, and map. A $55 pledge gets you a Lille Huset dollhouse, DIY design book, and carrying case. $75 will get you the birthday kit pictured above. $350 will get you six large Lille Huset dollhouses. While you can purchase Lille Huset Dollhouses through Grow Books Press now, this Kickstarter project aims to get the modern dollhouses into mass production thus lowering their price point. Thank you so much Michelle! You are the best!!! Alyson Beaton's Lille Huset Dollhouses Inspire Little Architects - Support the Line on Kickstarter! Alyson has created six different designs for her Lille Huset dollhouse town. The line is inspired by a little house in Chicago's Logan Square, which is a little neighborhood in a big city. 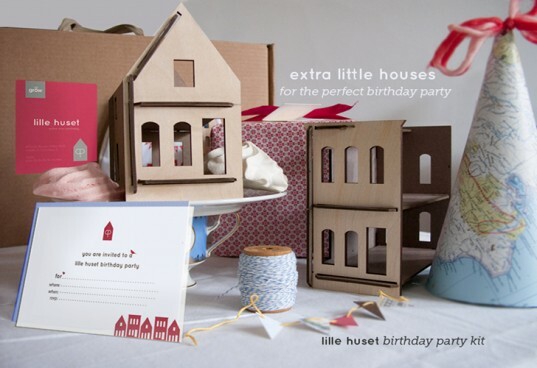 The Lille Huset kit includes: Your house, instructions, a carrying case and a DIY design book so your little designer can take notes, create some of the designs in the book and spend hours playing.